Even marketing rockstars sing the praises of Google Analytics, a free program that makes it possible to track various features of website performance. 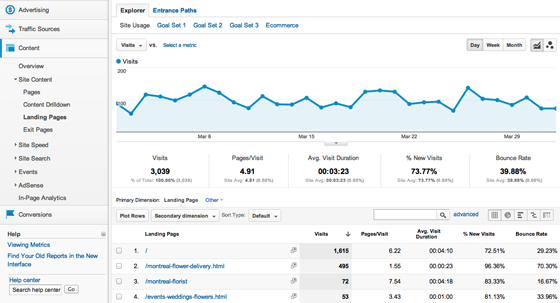 While there are other, proprietary programs that offer analytics features, this article focuses on using Google Analytics for analyzing landing page performance. If you don’t already have Google Analytics, go to google.com/analytics, sign up for an account and obtain your tracking code. Google Analytics tracking code should be placed on every page of a website the user wants to analyze. Websites using the WordPress platform can easily do this by adding the code to the main theme settings, or use Google Analytics for WordPress, which will automatically populate it on each page. You can also add it to your Unbounce landing pages by following these instructions. 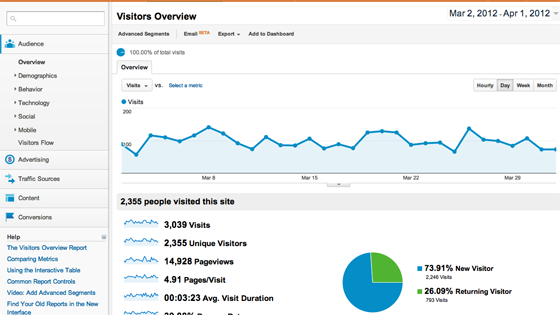 This dashboard offers a snapshot of website activity, including the total number of visits, new visitors and returning visitors, unique visitors, average time per site, average pages viewed per visit, and a bunch of other basic stats. To drill down to landing-page specific information, click on the “Content” tab in the left-hand column and select “Landing pages.” This screen illustrates the pages functioning as entrance pages on the website, or landing pages. To decrease bounce rates, a few factors should be considered. Are the keywords directing visitors to the page relevant? If using paid search, modifying the key terms you’re bidding for can help. For organic search, on-site content should be revised to reflect more relevant terms. Is the landing page design functional, and does it follow a logical eye path? If landing page design is too confusing for readers, they’re likely to bounce from the page. Does landing page content present a problem, a solution and a clear call to action? Landing pages that leave too much guesswork for visitors are likely to have high bounce rates. 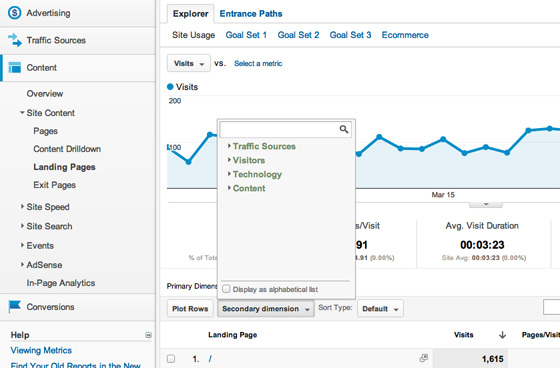 Google Analytics allows webmasters to set up specific conversion goals for optimal tracking. Examples of goals are “thanks for registering” pages or “download completed” pages. These types of pages indicate that a user has taken a requested action, and the resulting stats clearly show how well a landing page is converting based on completed goals as a percentage of total visitors. 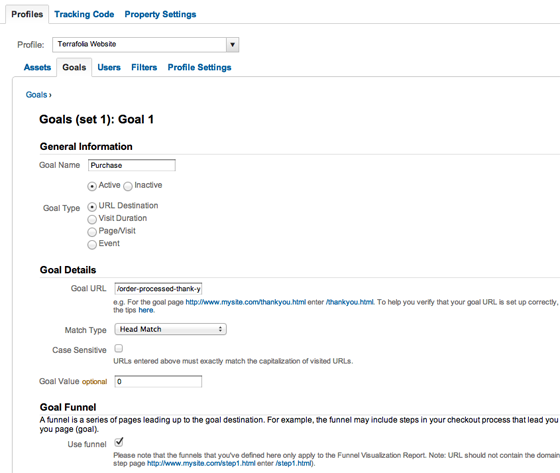 A basic Analytics account allows users to set up to four sets of five goals, for a total of 20 goals per profile. Goals are easy to set up and a useful way for tracking landing page performance can even be set-up to track Events, Pages per Visit, or Visit Duration as a goal. You should start out by using Head Match, like displayed above, and assign a goal value to help you understand what each visitor is worth. Finally, most webmasters are interested in analyzing data from under-performing landing pages, or even top-performing landing pages to determine where exactly the secret sauce lies. 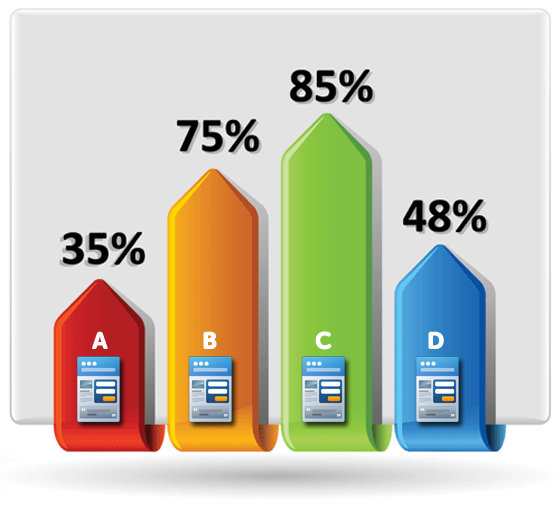 From the landing pages report, users can click on an individual landing page. The resulting screen looks much like the main overview screen, except the data represents the specific landing page only, not the site as a whole. In the toolbar directly under the graph, there’s a drop-down menu that allows users to select a secondary dimension. Herein lies the key to true landing page analysis. Note there are a number of options for drilling down data, including traffic sources, visitors, technology and content. Selecting the traffic sources option and filtering further to keyword, source, medium, campaign, ad content or visitor type displays the sources leading visitors to a landing page, so marketers can easily determine what search engines are sending the most visitors, what keywords have the highest and lowest bounce rates, and so forth. Armed with this data, marketers can fine-tune landing pages to meet very specific needs and monitor performance with a few simple mouse clicks. Landing page optimization is reliant on numerous variables, and Google Analytics offers a valuable selection of tools to track exactly how landing pages are performing in relation to each.